Having a good glass of tea on the go can be very inconvenient, especially if you prefer loose tea leaves, compared to pre-packaged bags. Thankfully, Libre has a fantastic glass created from poly, glass and stainless steel to keep you on your way. This glass stays cool to the touch, even when filled with hot water. You just put your loose leaf tea in the stainless steel filter, screw on the lid and turn upside down. It will brew your tea for you in moments. Then you just unscrew the filter and you are ready to drink from a very classy glass. This glass holds about ten ounces of tea. There are alternate ways to use your glass. You can view the 2 minute video here on how easy it is. I've taken a penchant to cold chai tea and it works well for that too, I just have to add the milk after I cold-brew the tea leaves. It's very durable, easy to clean and I love the glass/stainless look. Very pleasing to the eye. I was worried about loose tea leaves in my brew, but that has not happened. Healthy for you and economical, the Libre on-the go is available in a mug or a glass. 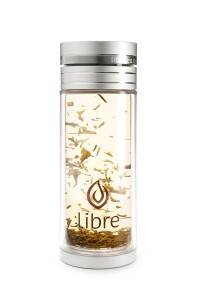 a Rafflecopter giveaway *I received a Libre Tea Glass to facilitate this review. All opinions are my own. My SIL has Anything Tea on her lis...tgis is great! My husband loves his Libre Glass. Wow!! I haven't worn anything new in awhile. I have some Coach and Gucci that I recently was sent. I love all floral or clean scents it is hard to narrow down.